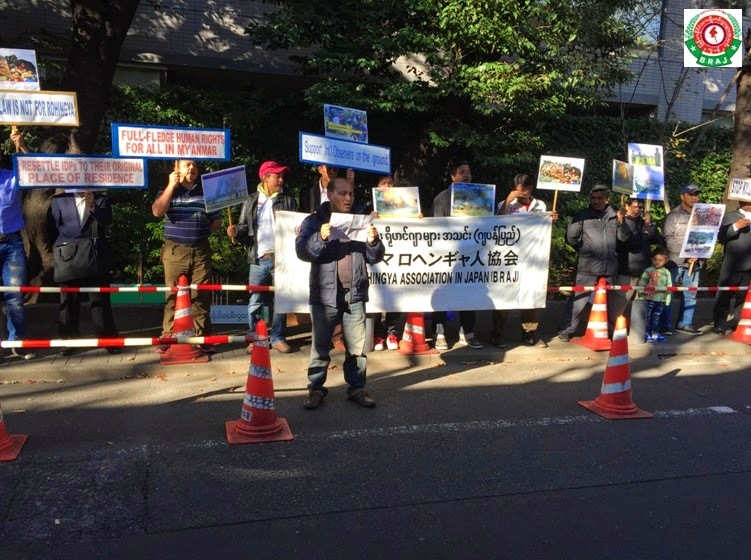 Tokyo, Japan – Burmese Rohingya Association in Japan (BRAJ) based in Tokyo have staged a demonstration in front of the Myanmar Embassy in Tokyo on Tuesday. Some local NGOs, media and university students join the event with 35 members of BRAJ. The event started at 2 pm and ended at 3:30 pm. During the demonstration, General Secretary of BRAJ Mr Sayedul Amin explained about the main objectives of organizing the event. The president of BRAJ Mr Haroon Rashid delivered the short speech regarding Rohingya citizenship rights, human rights violation and current situation in Arakan State of Myanmar. 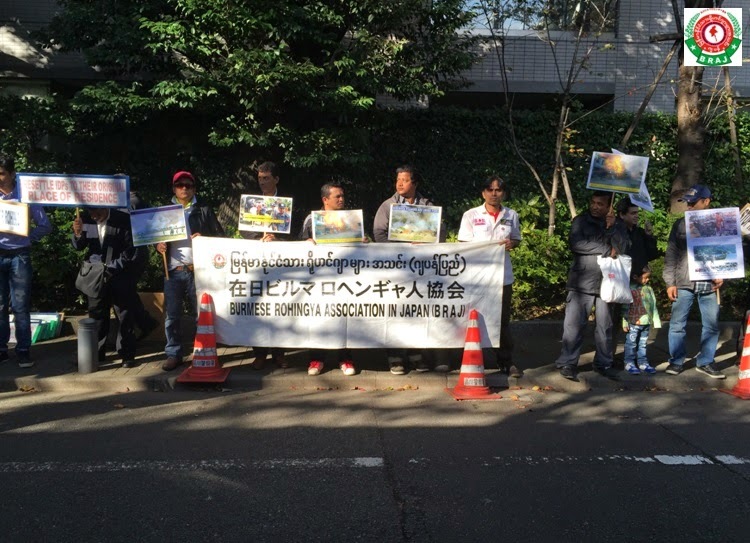 The participants energized the demonstration with the various slogans against Myanmar government’s policy on Rohingya. The BRAJ members submitted an appeal letter to the President of Myanmar, U Thein Sein through an embassy staff. 1. To implement rule-of-law and amend required acts in the 2008 Constitution of Myanmar. 2. To acquire peaceful co-existence with all nationalities in Myanmar including arms groups. 3. To protect and grant the rights of citizenships, the rights of religion and full-fledge human rights to all Muslims in Myanmar. 4. To restore and recognize Rohingya ethnic minority as Former Prime Minister U Nu in 1951 after independent, the controversial 1982 citizenship law effectively stripped Rohingya of equal access to citizenship, rendering them stateless. 1982 citizenship law is not for Rohingya, we are citizen of Myanmar by birth. 5.1982 Citizenship law contradicts universal declaration of human rights, and birth rights of Rohingya children. 6. To resettle all Rohingya in IDPs to their original place of residence and allow international aid groups to help for the reconstruction of their homes in their respective villages. 7. 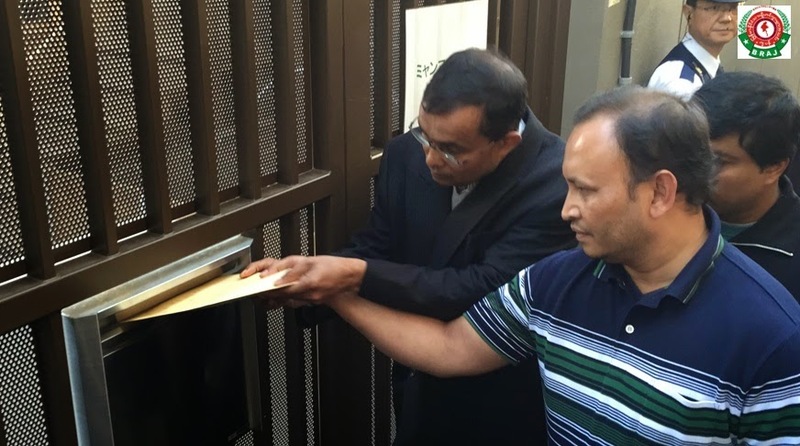 To annihilate the government forceful Citizenship Verification Process on Rohingya as Bengalis which harass Rohingya including arbitrary killings, detention and torture for not registering as Bengalis. 8. 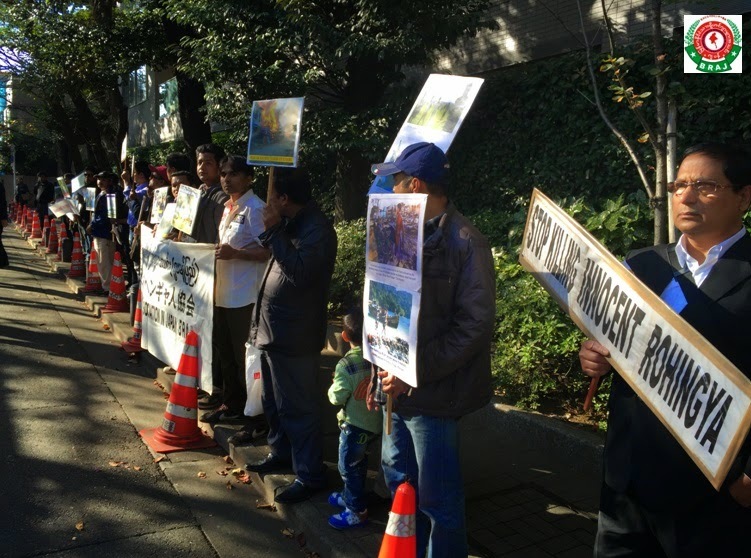 To oppose the central and local government Action Plan to segregate Rohingya displaced people to new permanent resettlement sites commencing in January 2015.